Daily Dzynmkr: Good eats after fixing my "beats"
Recently, they sent me an offer I couldn't refuse. A full year for under 7 bucks!! I quickly made my purchase online and then waited impatiently for the first copy to arrive. I was starting to get pretty antsy about it and then guess what happened today? Scott goes out to check the mail (using the front door - which we normally hardly open) and my copy of BHG is sitting on the porch. My neighbor two doors down wrote a note on my "invoice" envelop explaining it was in her mailbox. (I guess that explains the time lag). I finally got around to opening the plastic on my magazine (which also came with an All-Time Favorites 2011 Cookbook). The supplemental cookbook reminds me I have no idea what I'm making for dinner - except it will have something to do with chicken. 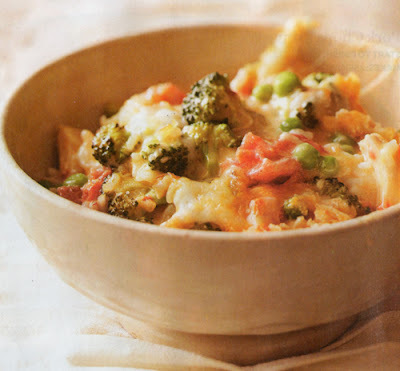 So, I flip through the cookbook, find something tasty (the Hot 'n' Cheesy Chicken Casserole), finish my grocery list and take off to the store. I returned from the store and started making dinner. I was worried my daughter might not like it (she's not a picky eater - just weird about food at times). To my surprise, she was asking if I would make it again after only a few bites. SCORE!! One of the cool homepage pics on the DIG Gardens website. When I did get a chance to look through the actual magazine, I wasn't disappointed. So many ideas for home decor, cooking, gardening and art! The most exciting thing I found in this edition is "living art". The combination of 2 of my favorite things. Cara and Will Meyers are owners of the trendy DIG Gardens in California. 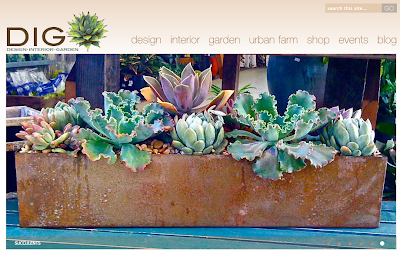 Go visit their beautiful website and drool over all the succulents in the shop. 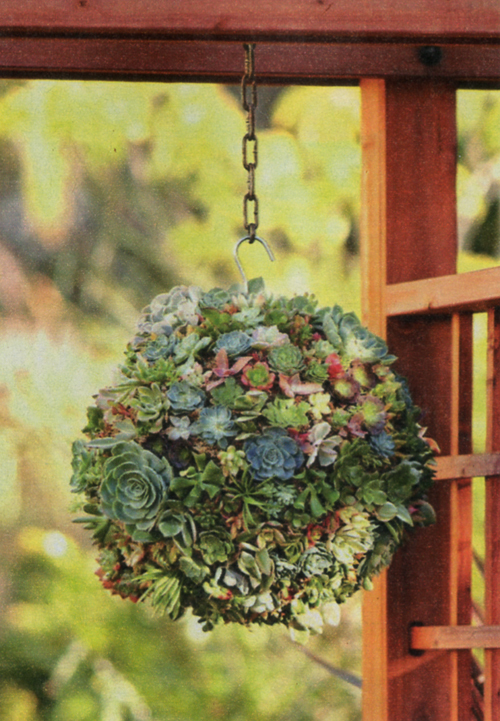 You can purchase a succulent orb form made from sphagnum moss - ready for you to add clippings and hang by the metal hook attached. People had questions about this orb and they've included more information in their blog. 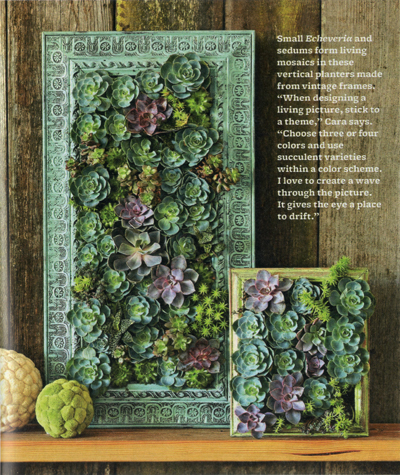 While I love the orb idea, I absolutely adore these vintage frames with "living art" in them. Fortunately for me, BHG.com posted a How-To tutorial for making this project. I will be trying this very soon! I hope the rest of you will join me. I guess you could say my $7 subscription to BHG has already paid off for me today. Not only did I find a good recipe for dinner - I found a new project to do. And let's not forget all the other fabulous recipes I didn't even begin to mention. You might be hearing about a few of them in the near future. Until next time - Happy Gardening, Cooking or whatever it is that gives you joy and never underestimate the power of a magazine (or the written word).